Free agent NFL quarterback Johnny Manziel was the passenger in a car that allegedly hit a light pole in Hollywood and fled Saturday, TMZ reports. His friend Ryan Silverstein—aka OVO Ryan from Drake’s OVO crew—may have been the driver. The person who picked up the two of them after the crash was Manziel’s former teammate Josh Gordon—who’s been suspended from the NFL for most of the last two seasons for failing drug and alcohol tests. Just recently, Gordon’s petition for reinstatement was denied after he failed a drug test last month. After allegedly fleeing the scene of the accident on foot, Manziel and Silverstein came back. The former first-round pick Manziel, who was released by the Cleveland Browns last month, admitted to being a passenger in the car when it wrecked, but isn’t accused of any wrongdoing. The former Heisman Trophy winner already made headlines this week when his agent, Drew Rosenhaus—Manziel’s second agent this offseason—threatened to terminate his contract with the talented quarterback if he doesn’t get treatment, according to an ESPN report. 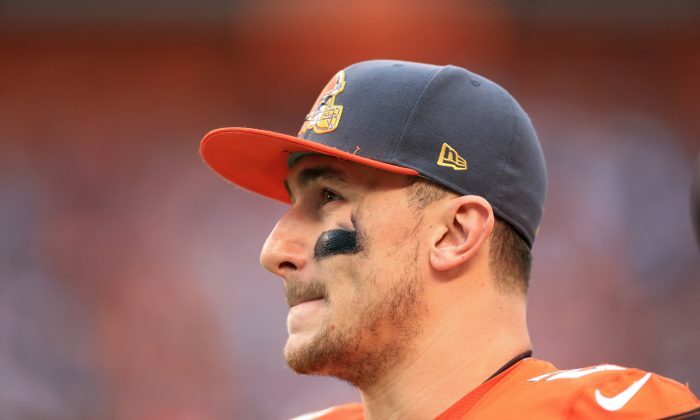 “I have terminated the standard representation with Johnny Manziel in the hopes of helping him get the treatment I believe he needs,” Rosenhaus told ESPN’s Adam Schefter. Manziel was previously dropped by former agent Erik Burkhardt, earlier this offseason. A year ago, the former Texas A&M star spent 10 weeks in rehab last offseason and is currently the subject of a grand jury investigation in Dallas regarding whether he assaulted his former girlfriend. According to ESPN’s Ed Werder, in his 27 years as an agent Rosenhaus has never fired a player. Is Manziel at it again? Of course he will. Just not as a starter.